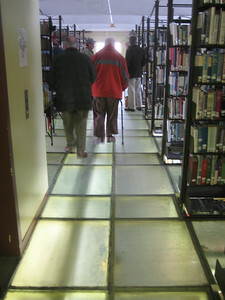 In the old stack wing of the Holyoke Public Library, we walked on glass floors. 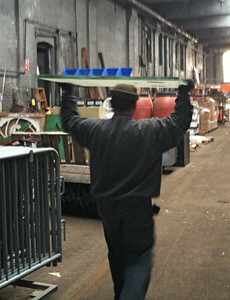 This photo was taken in winter 2010 on a building tour led by Mr. Tom Ripa. These "kit" stacks, constructed in 1902, were "state of the art" then, but do not meet 21st century building codes. 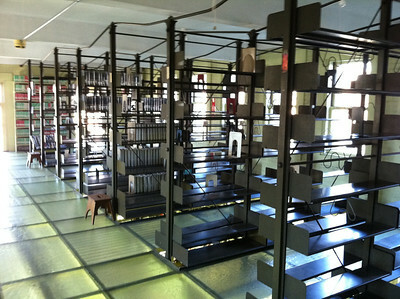 Note the open spaces below the shelving, connecting several floors in a chimney-like stack, a fire hazard. The aisles lacked adequate space for wheel chairs. 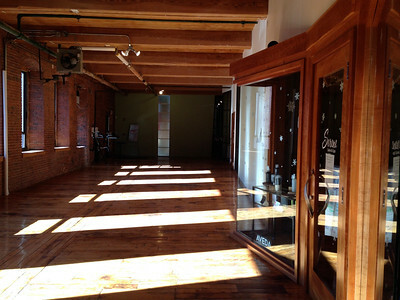 But the translucent floors were lovely. People walked on these glass floors for 110 years! 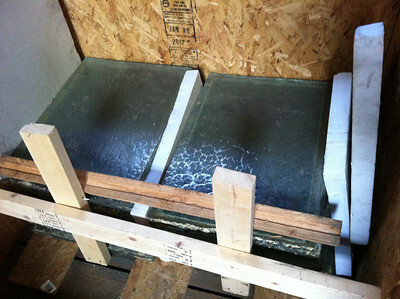 Note the different shapes and sizes of glass blocks. April 24, 2012. 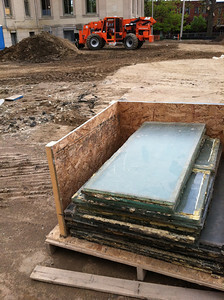 Some of the glass blocks had been removed from the stacks, while others remained for a while (for workmen to walk on). This crate shows Size G on top, Size E in two stacks in middle, and the largest, Size A, on bottom. 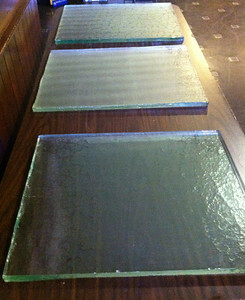 Size A (34.5" x 36") glass blocks. These are the LARGEST ones. For sale "as is" @ $175 each. It is estimated that this crate of 26 blocks weighs about a ton (2,000 lbs)! If so, each block would be about 75-80 lbs. 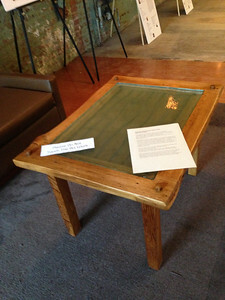 We have reserved thirty of this size for ARTIST proposals in early 2013. 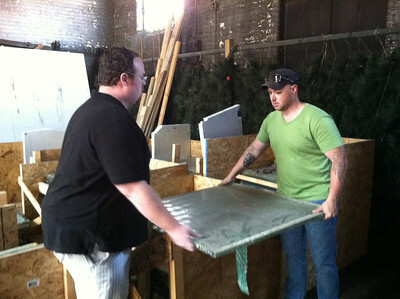 Rory Casey and Jeffrey Byrnes moving one of the largest blocks (size A). Heavy! 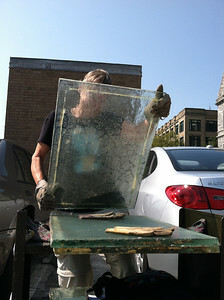 It is possible, but not recommended, for one (very strong) person to carry a Size A panel. These are smaller sizes. Size F (~ 19" x 27"). For sale "as is" @ $60 each. Size E (~ 19" x 26.5"). This sample was brought to the Library for display in the lobby. August 31, 2012. NOTE: Sizes D, E, and F are very similar. Variations in exact measurements make these sizes hard to distinguish, so we've priced them all the same @ $60 each (or $48 with the Friends membership discount). 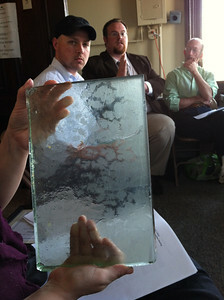 The idea of cutting some large glass blocks into smaller sizes and making products to sell (e.g., paperweights, bookends, plaques) has been discussed. We are open to proposals that would include the cutting and making of such products. Contact us. 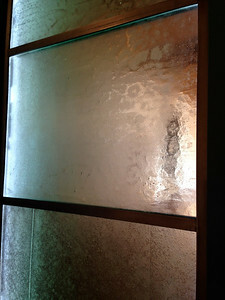 Translucent glass. 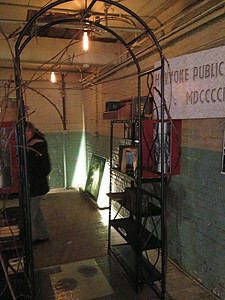 Initially, many of these large ones (size A) were reserved for ARTISTS and others who might submit winning proposals for creative re-use of these pieces of library history. 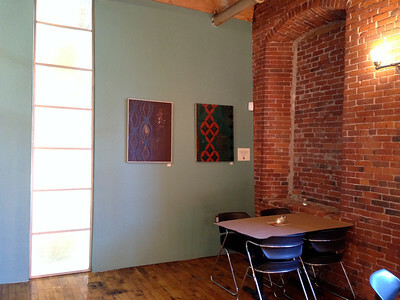 The resulting artwork was displayed in April 2013. 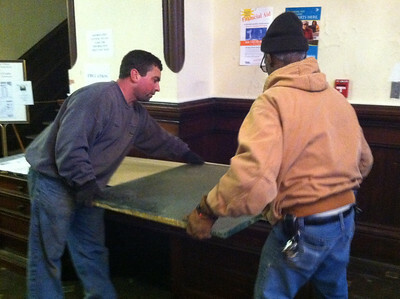 Size A block being put on display in the Library lobby by Peter and Ralph (from Open Square). January 9, 2013. 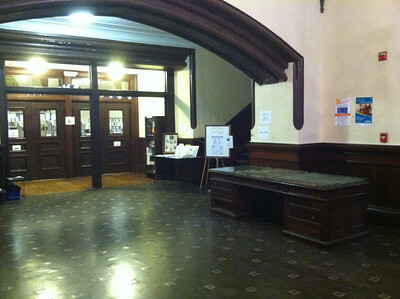 Library lobby in City Hall, 2nd floor. 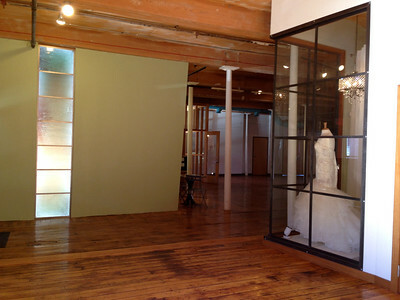 Note the large desk on right, temporarily topped the 3 glass panels. January 2013. 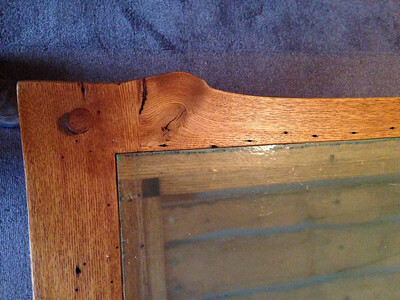 Note the textured nature of the original glass surface (near edge) and the smoothly worn areas where people walked for 110 years. 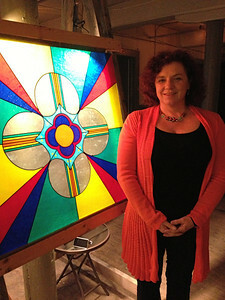 The large panel is an example of size A (~36 x 34.5"). 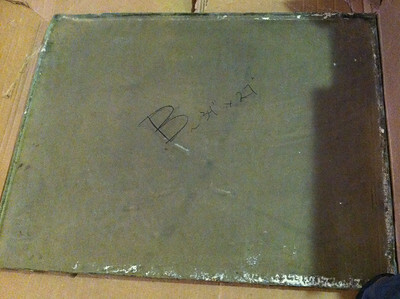 The 2nd panel (size B) looks shinier because it is upside down; its textured and worn surface is facing down. 3 more examples, sizes D (approx. 19 x 23") in foreground and E (approx. 19 x 26") beyond. 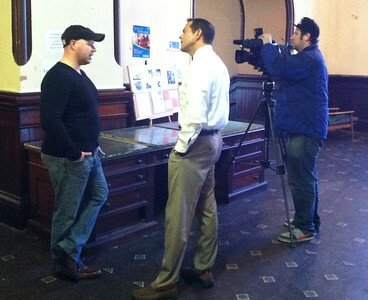 Chris Pisano of WGGB/abc40 team interviewing Jeffery Byrnes about the glass block initiative. Chris and videographer Amir Norman visited the library construction site after interviewing us, and put together a good overview of the project. 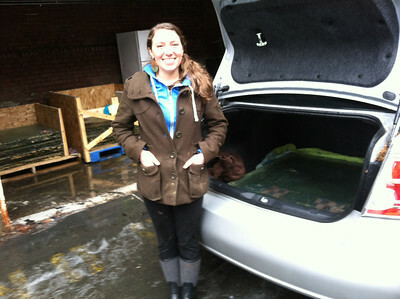 The resulting abc40 news story aired on the 6 o'clock news, Monday, January 14, 2013. 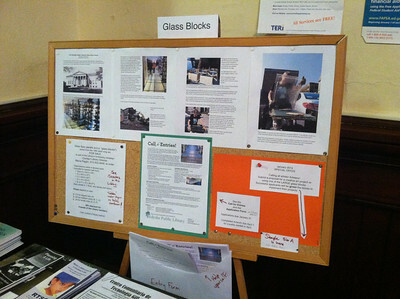 Bulletin board of information about the glass blocks. I finished setting this up just before the TV news team arrived. Good timing! Size B (approx. 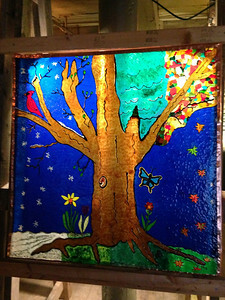 34.5 x 27") sells for $125 -- or $100 to members of the Friends of the Library. 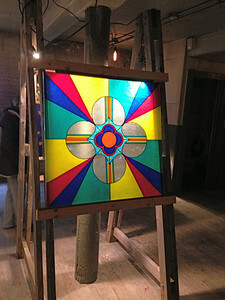 This is Size D (approx.19 x 23.5"), one of the SMALLEST of original floor panels. This size sells for $60 ($48 to Friends members). 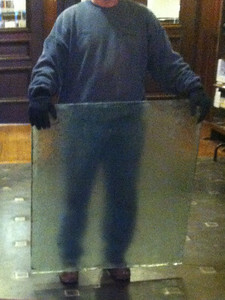 On a cold wet day in February 2013, we distributed large glass panels to the artists who had submitted successful proposals. Anna Rotty was thrilled to receive the historic glass! 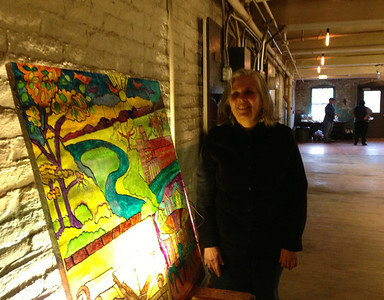 In April 2013 Anna's finished artwork was exhibited in the Wauregan Building. With permission of the Holyoke History Room and Archives, she selected and reproduced historic photographs taken in the 1880's by Milan P. Warner. 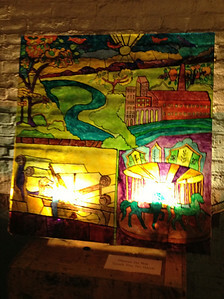 And another stunning example of art created with a glass floor panel. 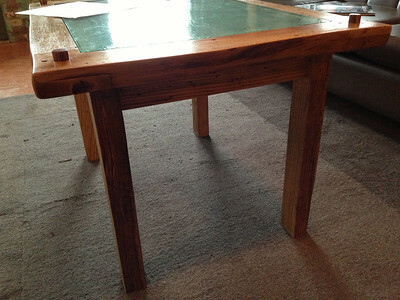 Beautiful table made by David Giese, Easthampton. For sale for $1000. On loan to the Holyoke Public Library. 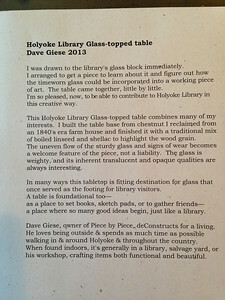 2014 update: This table is now on display within the newly expanded/remodeled Holyoke Public Library. 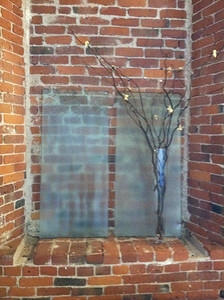 Library glass blocks from 1902 glowing in the wall of the Electric Café in Mill 1 at Open Square. February 2016. 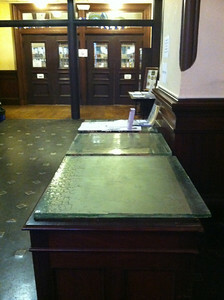 The Library's old glass panels show varying patterns of wear (from 110 years of use as flooring in the stack wing). John selected interesting examples and arranged them artistically. 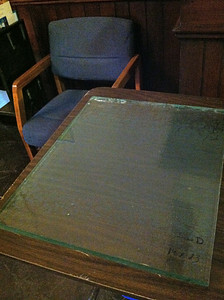 The glass is 1" thick and illuminated here by lighting along the frame. Lovely! 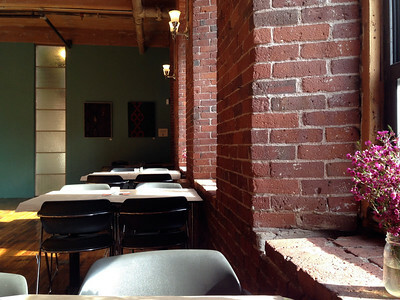 Electric Café on a bright afternoon in March 2016. 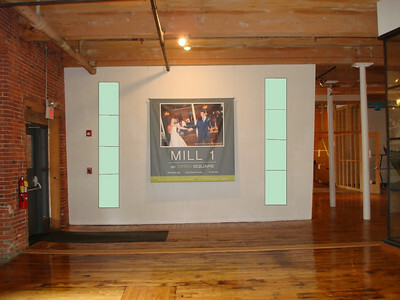 The library glass panels glow from internal lighting, while sunlight streams in from the right (see next photo). 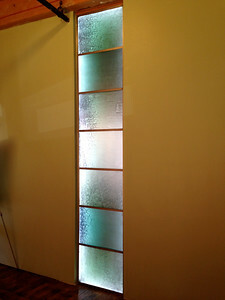 Size A (34.5" x 36") glass blocks. These are the LARGEST ones. 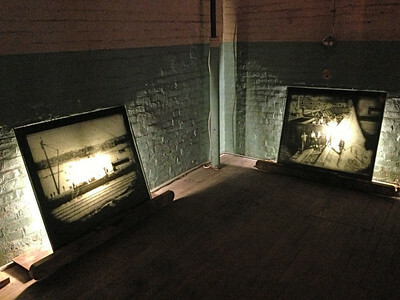 For sale "as is" @ $175 each. 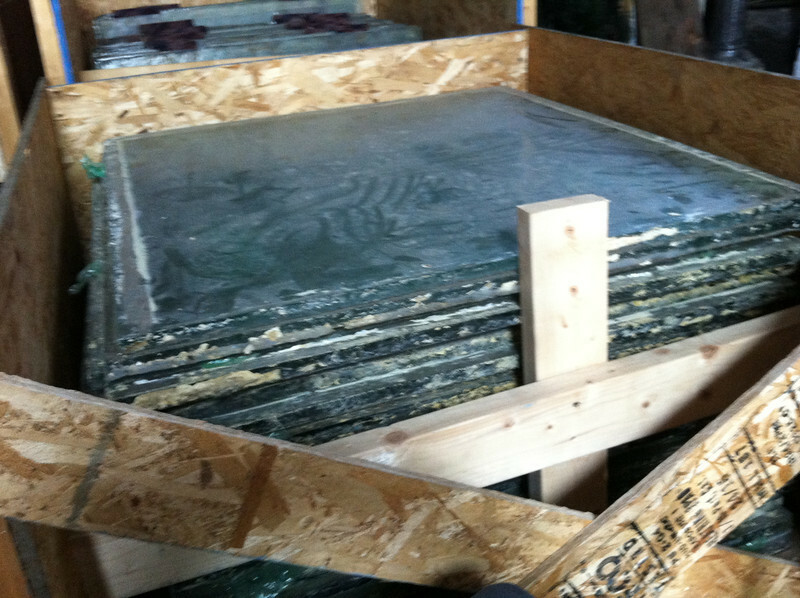 It is estimated that this crate of 26 blocks weighs about a ton (2,000 lbs)! If so, each block would be about 75-80 lbs. 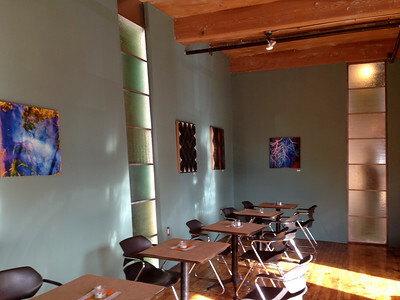 We have reserved thirty of this size for ARTIST proposals in early 2013.